Mines Rovers Football Club is celebrating its 120th birthday this weekend. I was set to be there but a back injury has made travel too difficult. A version of this story appeared in Footy Town: Stories of Australia’s Game edited by Paul Daffey & John Harms, Malarkey Publications 2013. I kicked the winning goal in a grand final and nobody noticed. More on that later. I grew up in Boulder. Despite the presence of the magnificent Boulder Town Hall, my hometown was always seen as somewhat inferior to Kalgoorlie with its statue of Paddy Hannan and its impossibly wide main street. Kalgoorlie even had a posh suburb called Lamington. In Boulder we had about three posh houses. Local government elections in 1969 could have consigned Boulder to suburb status but Boulder voters turned out in such numbers that in fact parts of the Shire of Kalgoorlie were gobbled up into the newly formed Shire of Boulder. In 1989 the Town of Kalgoorlie and the Shire of Boulder amalgamated to form the City of Kalgoorlie-Boulder and so the name lives on. The fact that WA’s gold rush coincided with a depression in Victoria had an interesting side effect – the rapid rise of the most important country football league in Australian Rules history. Many of the best footballers in Victoria headed west and many of them went straight to the Goldfields ensuring a high quality, keenly followed competition right from the start. TV came to the Goldfields in 1970 so while I was aware of footy in Perth and Melbourne (and even Adelaide and Tassie) and was a mad East Perth supporter, the players I watched were in the Goldfields Football League. It was a four-team competition: my team Mines Rovers (Diorites, a diorite is a very hard rock formed under conditions of intense heat) and Boulder City (Tigers) played at Boulder Oval while the Kalgoorlie Oval was the home of Railways (Redlegs, now Panthers) and Kalgoorlie City (Kangas). Teams from Norseman and Kambalda have played in the competition during my lifetime. Kambalda (Eagles) remains. 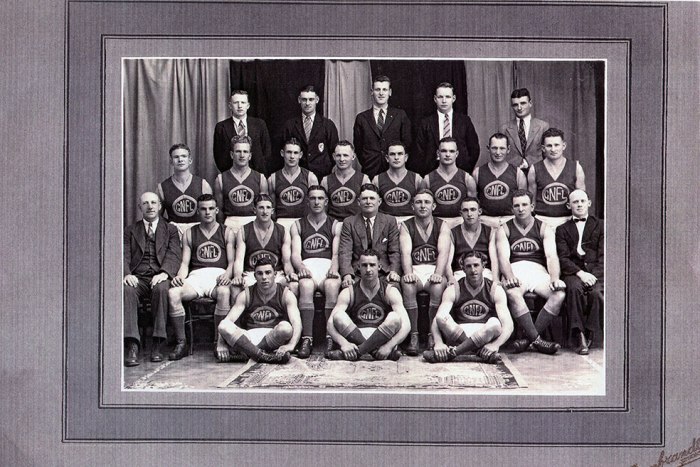 The Goldfields team that beat the South Australian state team in 1937. As I watched and listened I heard stories. About the time a combined Goldfields team beat the South Australian state team – it was in 1937 when the SA team was heading home from the national carnival played in Perth. The Goldfields won a high-scoring match by 27 points. I heard about visiting city club teams who were no match for the locals. In 1939 the Goldfields beat Claremont by 19 points and Port Adelaide by three points. Claremont won the WAFL premiership that year and Port Adelaide won the SANFL premiership. It was hard to believe that in the years before WW1 that the WA State team included players from city clubs and Goldfields clubs. 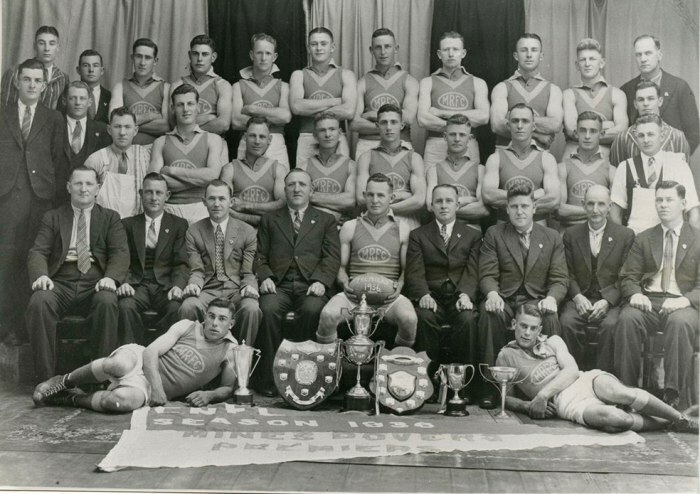 WA’s first state team had nine Goldfields players including the future Collingwood champion Ted Rowell, while the WA teams at the first three national carnivals included a healthy contingent from the Goldfields. The split was 50-50 for the first two carnivals and slightly in favour of the city teams in 1914. And I heard about the Sandover Medal winners who started out in Goldfields teams: Tom Outridge (Mines, Subiaco), W “Digger” Thomas (Warriors, East Perth), Jack Rocchi (Boulder, South Fremantle), Lin “Blue” Richards (Boulder, East Fremantle) and Steve Marsh (Railways, South Fremantle). And I heard stories about the mysterious Moonta Turks. I decided it would be good for someone to write the history of footy on the Goldfields. Best high mark: we agreed on Allan Kennedy from Mines who could easily leap from a standing start onto an opponent’s shoulders. One day at Boulder Oval he got a run up and marked on his chest at least a metre above a flying pack, it’s the best mark I’ve ever seen. Best kick (torp): we agreed on Ted “Punter” Robinson who went from Boulder to Mines to Railways. He kind of threw the ball to his boot and it didn’t seem to matter how far out from goal he was, they just sailed through. In 1967 he played for Claremont against a combined Goldfields team and enjoyed being back at Boulder Oval. He kicked nine goals. 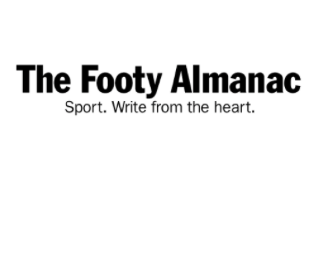 Best kick (droppy): I suggested Alan Poletti (Mines) who played 20-odd games for East Fremantle, Couf said Danny Green (Boulder). Best nickname: Jack “Cement Head” Neil (Kalgoorlie) for me. A tough player as the name suggests. Couf went for Alan “Humma” Spence (Mines). Best sideburns: John Graffin (Mines, Boulder)/Snowy Kennedy (Mines, Kalgoorlie). Sideburns were big and impressive in the late 60s and early 70s. This exercise would not go down as serious research but it must have sown a seed. 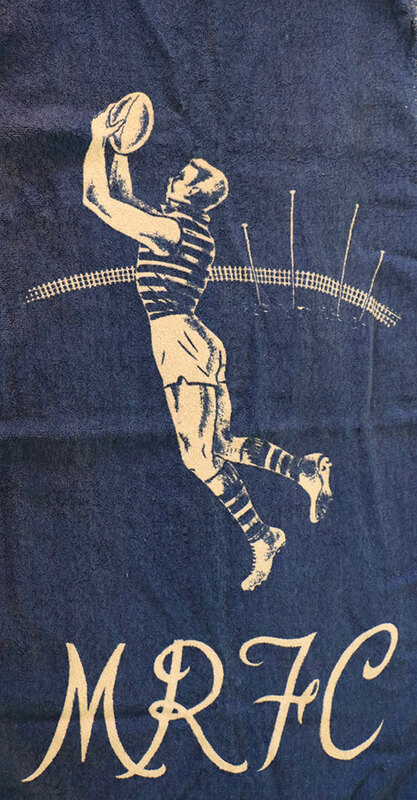 The project started at Subiaco Oval minutes after the finish of the 1988 WAFL Grand Final when Subiaco’s Mick Lee was awarded the Simpson Medal as the best player on the ground after his team Subiaco beat Claremont. Lee was an interesting Goldfields footy story. He was a star junior for CBC winning the GFL junior fairest and best award in 1978. In 1979 he found himself training with Tim Watson and others at Essendon while playing with amateur club St Bernards. A career with the Bombers didn’t eventuate and Lee returned to WA and a long career with Subiaco highlighted by the 1988 Grand Final. 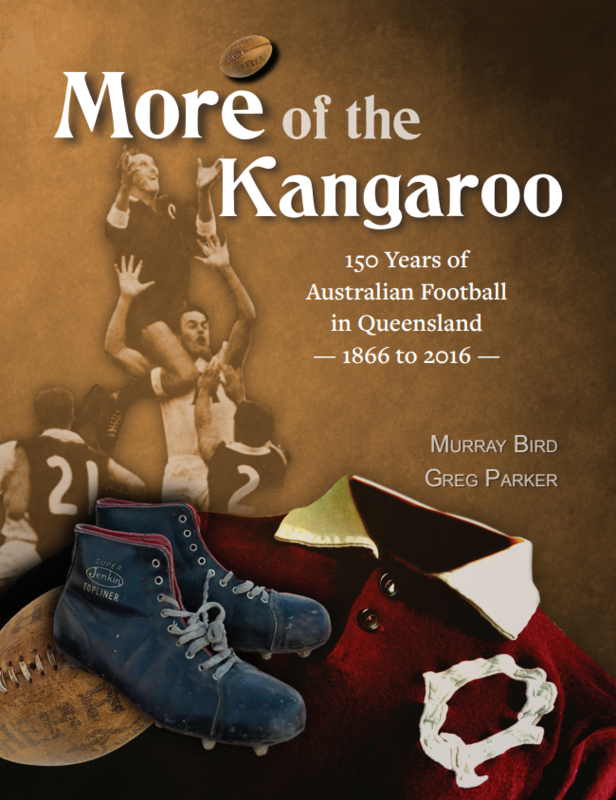 As Lee bowed his head to accept the Simpson Medal I decided to write a book about football on the Goldfields. In the following days I did two things. I sent out a questionnaire to anyone I could think of who had some involvement with footy in Kalgoorlie and Boulder and I made my first visit to the JS Battye Library of Western Australian History. Responses to the questionnaire flowed in providing many unexpected leads. For the next seven years I chipped away, researching, interviewing and writing with no clear idea about where the project was heading. I had two strong allies as I embarked upon my solo project – my father Les and my mother Peg. Les was an observant footy watcher and could recall details and the styles and quirks of players while Peg put me onto the story that changed things completely. A couple of my stories were published in The Kalgoorlie Miner and I used others in my history column in the WAFL’s Football Budget – so people knew what I was up to. 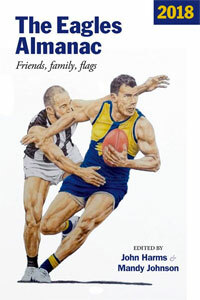 Then 1996 appeared on the horizon – the 100th anniversary of the formation of the Goldfields Football League (under various names). The league needed a book and I had written it. I was linked with editor John Terrell and away we went. Gravel Rash was launched at the Kalgoorlie Racecourse by Kevin Sheedy and later at the Orient Hotel in Fremantle by Steve Marsh. 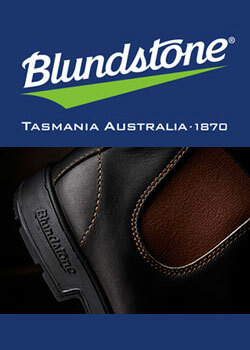 It was off to a good start – launched twice and each time by a member of the Australian Football Hall of Fame. I played for Mines because that’s what the Everetts did. As with many close family-footy ties it could have been different. The story begins with my uncle Keith “Muscles” Everett who got his nickname for the same reason as Ken Rosewell – there was nothing to him. He stood 168cm tall and weighed 54kg but Muscles was strong – lifting sides of beef while working with his two brothers Les and Jack at Everett Brothers Butchers saw to that. Muscles gained his reputation playing for the Moonta Turks who were part of a second-tier competition called the First Rates in the days before there were organised junior or reserve teams. First Rate competitions were common up until the 1940s but I simply don’t know where the title came from. The First Rate teams were a mixture of upcoming teenagers and older players without either the will or the skill to play in the “big” league. Muscles became a valuable player for the Diorites and played in two premiership teams, the second in 1940 after making a comeback from a horrible injury sustained in 1938 when he broke his ankle, played on and was then carried home. There were all sorts of complications including gangrene that led to a lengthy hospital stay. Ball thrown in by Boundary umpire. Pack flew – including Young who appeared to get a blow in the face. Young apparently blamed Everett and immediately struck him. Could not say if blow Young received was accidental. When the pack flew he (Gannon) was watching a Mines’ player who was standing back and appeared to waiting to come in and “get” someone. Young was right. An Everett had whacked him but he’d turned around and bashed the wrong brother. The tribunal decided to stand down Young for three weeks. Keith’s son Peter (a very good cricketer) was a B-grade footballer with a throw-it-on-the-boot kicking style not unlike Phil Krakouer and Punter Robinson. And, despite the Grand Final triumph I’ll tell you about later, I was B-grader too. When I was young I thought Italians had some sort of natural advantage when it came to sport and footy in particular. The evidence was there: Alec Epis, who did a bit of work at Everett Brothers Butchers before his great deeds at Essendon, the aforementioned Alan Poletti, who was a brilliant athlete, and perhaps most of all Charlie Osmetti. These young men were good at athletics, footy and in Osmett’s case, cricket too. The Osmetti family had a far greater influence on the Diorites than the Everetts and they also got to the blue and whites in an unusual way. Jack “Jacko” Osmetti was the eldest of four sons of Italian immigrant Carlo “Charlie” Osmetti. The boys were all under 10 when their father and five others were killed in a mining accident at the Golden Horseshoe Mine in Boulder. The boys’ mother later remarried and the family took over the running of Cornwall Hotel. Jacko impressed as a footballer from an early age and was one of the young stars for the Moonta Turks who played on a gravel ground called the Horseshoe. Early in my research I called Jacko at his home in Boulder, next door to the Cornwall Hotel and asked if I could speak to him. He’d received my questionnaire and he wasn’t too keen. “I don’t want to talk about who was the best this and best that,” he said. I explained that the questionnaire was just a starter and that really I was looking for stories. Jacko warmed to the idea, agreed to meet and told me lots of stories including the one about how he came to join Mines Rovers. Both Boulder clubs spoke to Jacko and he decided to join Boulder City because his father had once been a member of the club. It was arranged that a couple of officials from the Tigers would pick up Jacko from outside the pub and take him to a scratch match as preparations for the 1928 season began. A car pulled up outside the Cornwall Hotel where the boy waited, footy boots in hand. Inside were Mines captain “Pinky” Trewhella and club stalwart “Kegga” Burgess. The pair had also played for Moonta Turks. Jacko Osmetti became one of the greatest ever players for Mines. Attempts were made to lure him to West Perth and South Melbourne but he always argued that he was earning good money on the mines and there was no need to leave Boulder. Jacko was solidly built and relatively short but he knew how to get the ball. Mines Rovers premiership team of 1936. That’s Charlie Osmetti front left near the trophies and Joe on the right. Cyril is in the back row fourth from the left. 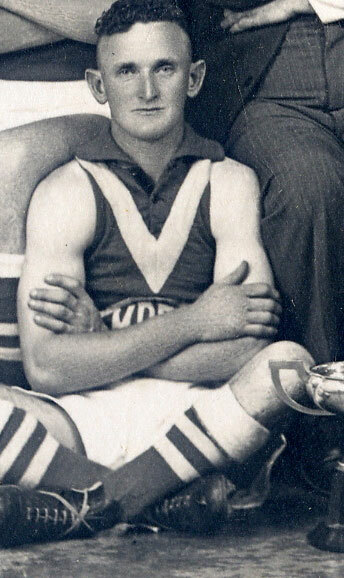 Jacko’s brothers Charlie and Cyril were important members of the dominant Mines teams on the mid to late 1930s and both played for East Fremantle during military training. Charlie was a rover and forward of the highest quality, he kicked five goals for the combined Goldfields team in their famous victory over South Australia in 1937, he kicked nine goals for Mines in the 1936 grand final and six in the 1937 decider. Another brother Joe “Moa” became a prominent umpire. Jacko’s son Charlie played 65 games for South Fremantle and later returned to help Mines to premierships in 1970 and 1972. Moa’s son Brian was a long-standing secretary of the Mines Rovers Football Club It’s fair to say Mines got a good return from “kidnapping” young Jacko Osmetti from outside the Cornwall Hotel in 1928. Mines Rovers are the most successful club in the Goldfields Football League. They have won 42 league premierships. However their record at colts (juniors in my day) level is not so hot. The organised junior competition, consisting of teams from the four league clubs plus teams from Christian Brothers College and Eastern Goldfields High School, began in 1951 and Mines managed premierships in just 1954, 1972, 1982 and 1996 before taking the flags in 2011 and 2012 that suggest things might have finally turned around. Perhaps it was the fruitful relationship with the Moonta Turks that started the lax attitude towards junior development at the Diorites. They also became adept at snaring players from the school teams when they graduated from the junior ranks – often with small inducements. I joined Mines in a similar fashion to Muscles – though with an attitude that was more passive aggressive than my uncle’s direct approach. Playing for the school football team was compulsory at Christian Brothers College Kalgoorlie – if you were any good. A floating bone in a knee kept me out of sport in my early teens but by the winter of 1969 I felt ready to go again. There was always one chance to get a game in the school team – when the cadets went on camp. One day the school headmaster Brother Quilligan came to the classroom and asked for volunteers among the non-cadets to make up the numbers in the footy team on the weekend. I stood up. He told me to sit down. That afternoon I rode my bike to Boulder Oval and started training for Mines. This leads neatly to 1972 and the grand final that began this story. In 1954 Mines had probably the best junior team ever on the Goldfields. 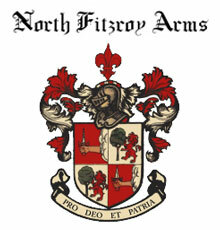 The line-up included Alec Epis (dual premiership player with Essendon), Fred Seinor (219 games and a premiership with South Fremantle), Brian Macgregor (150 games East Perth), Allan “Humma” Spence (six premierships for the Diorites), Jimmy Mitchell (37 games Swan Districts), Matt Botica (top ruckman for Mines and Boulder through the 1960s) and Jacko Osmetti’s eldest son John who was later an A-grade premiership player with Mines. Mines waited until 1972 for their next junior competition success. 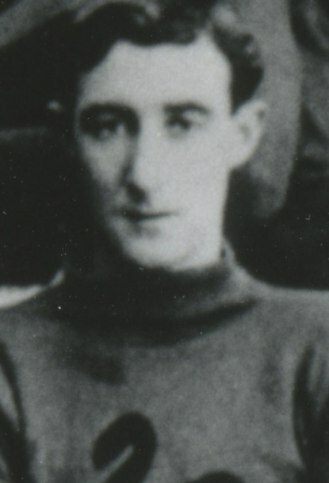 The team, coached by great Diorite wingman Bruce Weir, was not star-studded but dominated the home and away season losing just one game. The grand final was set for Sunday 17 September. We would be playing against my school CBC. 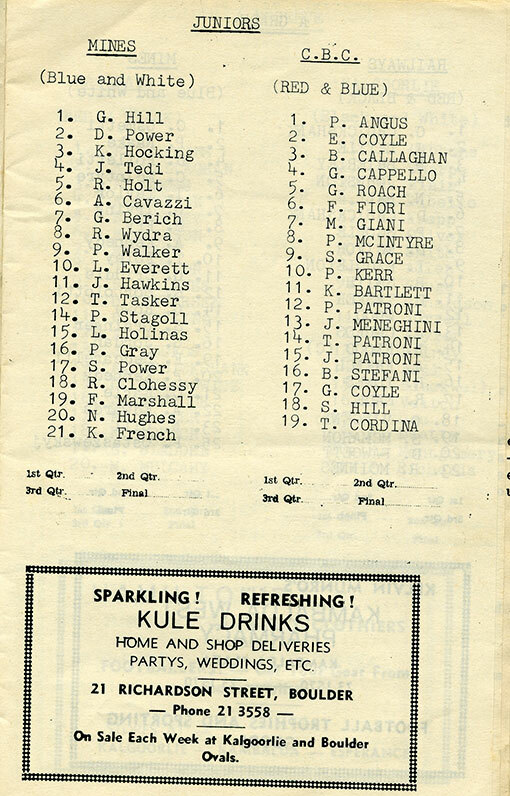 The teams as they appeared in Footy ’72 published by Lyndon Humphrey and John Bowler (now the Mayor of Kalgoorlie-Boulder). On grand final day a howling southerly ensured most of the day’s action would be at the scoreboard end of Boulder Oval. Mid-way through the third quarter a loose ball came to me at centre half-forward at the northern end – I took a pot shot with the breeze and it sailed through for a goal (it may have been more graceful and complicated than I’ve described). It was the last goal of the game. The ball spent most of the last quarter in CBC’s forward line with our defenders holding the fort, midfielders helping out and forwards playing well up the ground in a thoroughly modern fashion – trying to retain possession with handball as time ticked away. Mines won by five points. It was a sweet victory. Our captain Kevin French dominated the ruck, centre half back Phil Walker had plenty to do and did it well while skilful rover Greg Berich and the indefatigable Shane Power were awarded best player trophies. I’d kicked the winning goal but it was so far from the finish that nobody remembered. No one from the team became a household name in football though Trevor Tasker went on to play 188 A-grade games for Mines and Les Holmes was a strong player for Mines and later South Bunbury. After the game some of us were taken to the Cornwall Hotel where I had my first beer in a pub. Just one. We were back at the Boulder Oval to see the start of the A-grade grand final between Mines and Railways. And what a start it was! 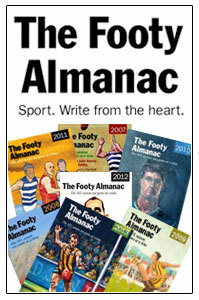 The opening bounce was crooked and favoured Mines centreman Allan Kennedy. He leapt high and knocked it down to captain-coach Charlie Osmetti who, mindful of the breeze, went long with his left foot. The ball went over the oncoming players and bounced through for a goal. First kick of the grand final. How could you lose after a start like that? If you could sit back and relax on a bench seat I would’ve done it. Osmetti kicked five goals in the first quarter, Mines never looked back and won by 45 points. The game was telecast and shown that night on the local commercial TV station VEW 8 with commentator Clem Baker calling the shots. Osmetti’s seven-goal performance looked even better on TV. The whole family watched in our Boulder lounge room and rejoiced when in the lead up to the game they showed a snippet of the juniors game and I was in it. Mines ruckman Gary Jordan was a big help to Osmetti as was his co-rover Greg Criddle who also kicked a couple of goals. First year player Colin McIntyre, later to be named captain of the Goldfields All Stars 1950-93, was dangerous in the forward line while the long kicking of full back Peter Ostaszewskyj was a useful asset. Two weeks later I was at Subiaco Oval to see East Perth beat Claremont in the WAFL grand final. It was the perfect football year. I recall receiving an envelope containing a two-dollar and a one-dollar note some time in the aftermath of the 1972 junior grand final victory… my part of the $60 premiership incentive. I don’t think we needed it. Things went back to normal for the Mines juniors after 1972 with no success for a decade. The senior team fell into the greatest slump in the club’s history, waiting 19 years for another flag. A key moment in my football career occurred after training one night in 1972 as I crossed Boulder Oval with team mates Les Holmes, Phil Walker and Trevor Tasker. The A-graders were still at it, doing sit-ups and yelling and screaming. “I don’t reckon I could do all that,” I said. The others thought they could. In 1973 I played a couple of B-grade games before heading to Perth in 1974 and playing amateurs with Graylands Teachers College. In 1976 I returned to the Goldfields for a teaching practice at Kalgoorlie Primary School where Mines Rovers coach Charlie Osmetti was the deputy principal. It was during this stint that I played my only A-grade game for Mines. I started on the bench in the days before interchange and came on with about five minutes to go to replace John Duffy, father of former Docker Max. There was a boundary throw in and I gathered the ball. Colin McIntyre cruised past. In that split second my football brain worked overtime. “Colin,” it said, “you get 30 kicks every week I could handpass this to you but a kick is a kick and I’m gonna kick it.” My A-grade stats remain at one game, one kick. Premierships have been plentiful for Mines Rovers in modern times including seven between 2001 and 2010. While my slackness as a teenager robbed me of the opportunity to see if I could play decent senior footy on the Goldfields I reckon putting my head over the ball and writing Gravel Rash was some compensation and maybe a redemption. And have I ever told you about the time I kicked the winning goal in a grand final? Happy 120th to the Diorites. I played a season for Mines in 1988. We lost the grand final to Kalgoorlie, who had finished fourth, but under Glen O’Loughlin blitzed the finals to win the flag. The less said about my shocker in the GF the better. Tony, you’ll be pleased to know Kangas held a premiership 30-year reunion on the same weekend. You would have enjoyed that…. Just wanting to know whether or not they remember a Colin and Kevin Keenan who i believed played for mines from 1962 through to 1967 i believe. if so is there any pics of them. I remember the Keenans… I don’t think I have photos of them but they might be in team photo on the walls of the club. Mines Rovers are a pretty active club. You might be able to contact via Facebook. In the meantime I’ll keep them in mind while I’m snooping around. I’m Kevin and Colin’s young sister, my mum and dad are Patricia and bill Keenan ( Charlie). I currently live in Kalgoorlie. The funny story I was told later in life, I was named after Kerry Everett. Hi Kerry , I played football with Kevin & Colin in Esperance and they were both wonderful fearless players although Colin was probably the most polished and I am sure there would be photos of them at the Esperance F.C.